Create a piston mount for a shifting gearbox from a drawing. For a step-by-step overview, view the video below. Download drawing from “Files” section below. 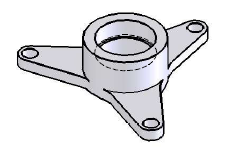 Extrude a cylinder for the center hub. Use extrude cut and the hole wizard to create the two parts of the through hole. Extrude one of the “wings”. Add fillets. Use circular pattern to create the remaining two “wings”.